Studies of comparative neuroanatomy provide information about structural variations that in turn can be clues to function. It is in this spirit that we use the mustached bat Pteronotus parnellii as our example in this paper on the inputs from the cochlear nucleus to the superior olivary complex. We will show that the projections from the cochlear nucleus to the lateral superior olive (LSO) are virtually identical to those of other mammals, but the projections to the medial superior olive (MSO) are different in that the ipsilateral input is extremely sparse. We shall propose that this difference is in the proportion of the ipsilateral to contralateral inputs, not that there is a unique input to the MSO of the mustached bat. We will focus on the functional consequences of the unusual pattern of inputs to MSO. 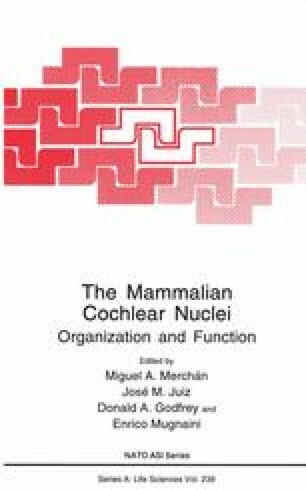 We will argue that one of the consequences of the bat’s adaptations for echolocation is the evolution of the MSO into a structure in which a difference in projections from one cochlear nucleus produces great functional differences.